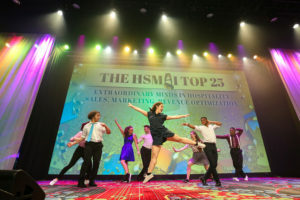 For the 2018 HSMAI Adrian Awards, our client wanted to add dancers onstage to go along with the theme of celebration at this year’s event. We also wanted to address a past issue with stage traffic and ensure that winners and speakers were directed smoothly during the live show. With 92 people taking the stage throughout the Adrian Awards show, this had proven to be a bit tricky. So, we decided to solve both of these challenges with one solution! By utilizing a professional dance troupe, we could bring both choreographed dance and smooth live direction to the show. After seeking out a few options, we went with the dance troupe La Salsa. Their Director seemed very clear on what we were looking for and engaged completely with our goals. We gave them a rundown of the interstitial and directional moments within the script, guidance on the event’s musical style, and some visuals of the theme to lend to the right costumes. Our script writer and production team mapped out the movements for the speakers within the script, and we talked them through it live. They then blocked this out, choreographed, and presented their ideas to us in a live rehearsal in their studio. From there, we built-in both a spacing rehearsal on the real stage at the Marriott Marquis and full tech rehearsal with music and lighting. The dancers were present throughout our Speaker rehearsals, getting acquainted with the real people they would be leading during the show, and lending their knowledge of stage directions and terminology to better the clarity of direction throughout. Our client was thrilled they got their energetic dance element, and we were happy not to have added much time to the program, while solving an obvious functional problem. A win-win, and a wonderful show!